As part of the service we provide to you, we continually strive to give you the information and tools you need to confidently manage your condition at home. We do this through consultations, this website and support groups. Persistent pain can alter your life significantly, and we want to help you on the right road to recovering your life. Through our specific pain education consultations, we’ll help you establish physical, social and work goals and develop a realistic plan to achieve them. Research has shown that by understanding the basics of the neurobiology behind pain, your pain can actually reduce (Butler & Moseley, 2013). All our consultations include education, however to adequately understand how and why we feel pain more time is needed for discussion. You can attend pain education consultations with our osteopath and pain management specialist Elizabeth Howard to better understand and manage your pain. Recent progress in neuroscience and imaging has led to major advances in our understanding of pain and this opens up more treatment options and self-management strategies. Liz can work with you to develop a plan of achieving your goals. This service is offered when you have received a diagnosis and would like to learn more about the next steps forward. The initial consultation will include a thorough discussion of your medical history and lifestyle, diet and sleeping factors. A physical examination may be necessary before Liz can develop your pain management plan. Understanding why you have pain or symptoms is an important part of your consultation. Do I need a referral for a pain education consultation? Consultations are provided as osteopathic services and as such you do not need a referral to book an appointment. However, if you have a chronic medical condition of longer than six months, including pain, you may be eligible for Medicare rebates via the Chronic Disease Management Plan. Your GP can provide you with a special referral form to claim, or you can visit the Medicare website. These group pain education classes focus on the neurobiological mechanisms of pain. Conducted in everyday language, they can vastly improve your understanding of pain and self-management. 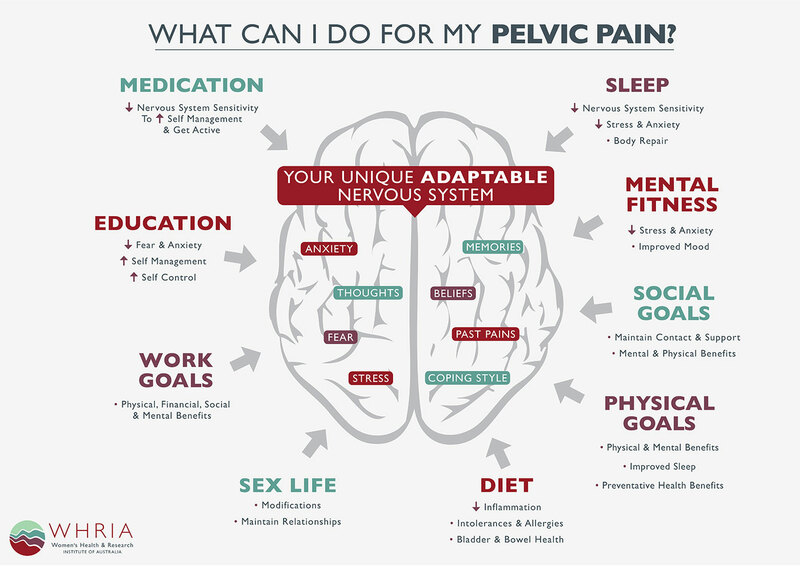 Courses also cover pudendal nerve anatomy, exercise, stretching, pelvic floor, bladder and bowel care, mindfulness and general everyday tips from others living with pelvic pain, or conditions such as pudendal neuralgia or endometriosis. 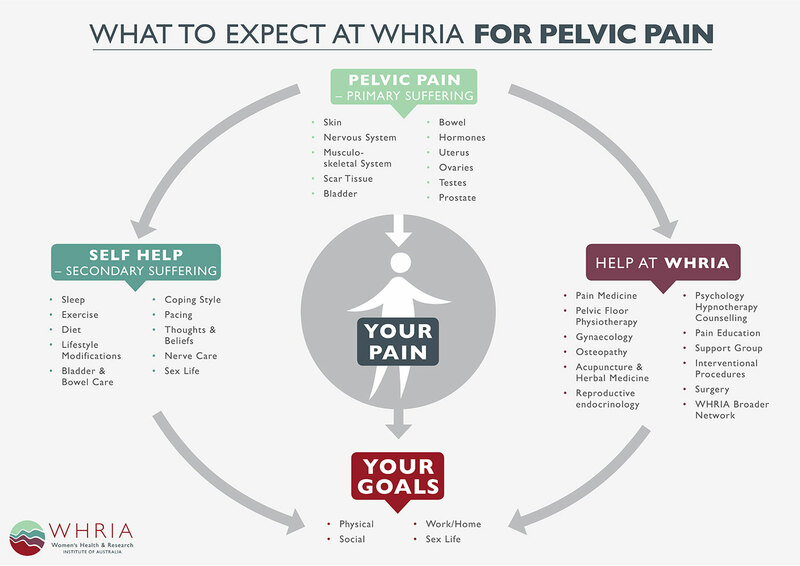 Please email support@whria.com.au to register your interest in this service and for the next available dates. Gentle Yoga for Pelvic Pain in Sydney’s Inner West with Rebecca Shaw from Akasha Yoga. Contact Rebecca via rebecca@akashayoga.net for details of the current course. These courses are very reasonably priced. Evening Visualisation for Relaxation and Health at WHRIA with hypnotherapist Letitia Colautti. Contact Letitia via letitiacolautti@gmail.com for information about the next evening. These evenings are currently free of charge. We publish quarterly e-newsletters that focus on self-management techniques and new advances in pain management, current research projects and more. Join our mailing list below for these newsletters. For more information on our Pain Education & Support services.